Below are my personal ratings as to how these three cameras work for me. I've put together various categories and ranked the cameras in order. I've added some brief explanations as to why I've made my choices. In their basic forms pictured above the Sony handles the best because of the new grip. However if I add a handgrip or battery grip I prefer both the Fuji and Olympus over the Sony. None of these cameras are particularly good examples of menu layout ergonomics, but the Fuji just comes out on top because it's slightly easier to navigate. Sony and Olympus really need to do better with this. No surprise here with the number of companies making m4/3 lenses and Sony's usual tardiness in getting lenses out. Fuji have yet to produce a lens that is anything less than excellent. 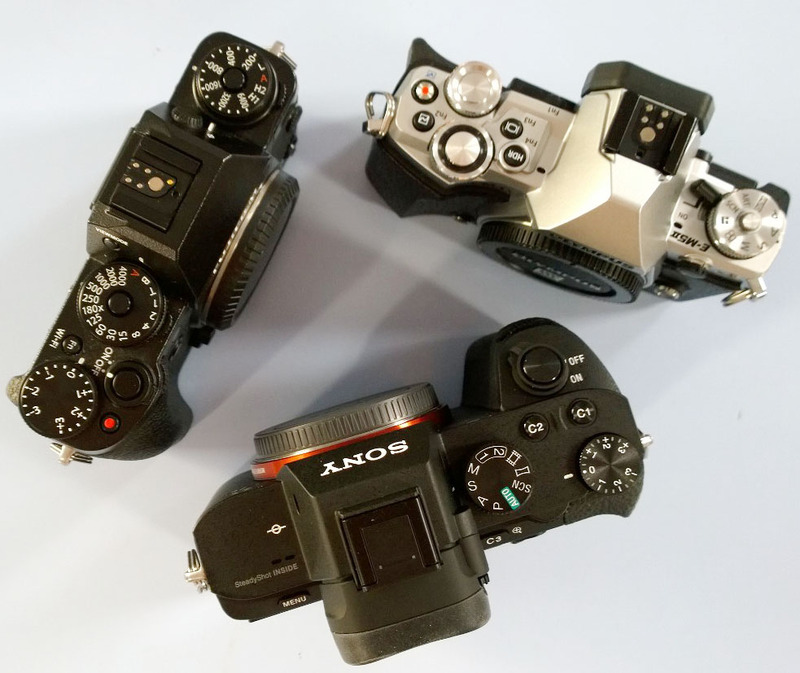 m4/3 has a few too many 'ordinary' lenses and Sony is...... well Sony! I expect there are differences here, but I have no way to accurately measure them. I'm very happy with all three cameras in this regard. They are all very quick to focus and get the shot. Again I find this difficult to split. The Sony EVF is great in low light, the Fuji has a 'big' view and the Olympus has a fully articulating screen. Swings and roundabouts here. The Olympus IBIS just shades it over the Sony for me. Difficult to do an objective test, but I seem to get less failures at slow shutter speeds with the Olympus. Fuji doesn't have IBIS but the lens OIS is the best I've used. However, they are only including this in their zooms, so that relegates them to last place here. Pretty much a foregone conclusion here. Sony win by some distance. Fuji have to do better with this. Which to be fair, they have admitted. Olympus? B+ for making an effort but could try harder. Both the Fuji and the Sony are simple quick and efficient for focusing third party manual focus lenses. The Olympus makes this a total pain. For me Sony are clear winners here. Their jpgs. are the sharpest and least noise reduced. The Olympus wins this purely because of the 64MP High-Res mode. And yes I know it has limitations but for the ultimate quality from a raw file the Olympus has the highest resolution from anything other than medium-format. And though it does require multiple exposures and a tripod, it is still the best in terms of image quality. As with the jpgs. Fuji suffers from over zealous noise reduction, though software like Iridient Developer and Photo Ninja go some way to bypassing this. WHICH CAMERA WOULD I BE HAPPIEST USING ON A PROFESSIONAL JOB? The Sony wins this because of the higher pixel count, 'full-frame' pixel density and the best battery life of the three cameras. WHICH CAMERA WOULD I BE HAPPIEST USING ON A STOCK PHOTOGRAPHY SHOOT? The Olympus wins here because of the lighter, smaller body and smaller lighter lenses, plus the versatility of that high-res option and the 5-axis IBIS which is excellent. 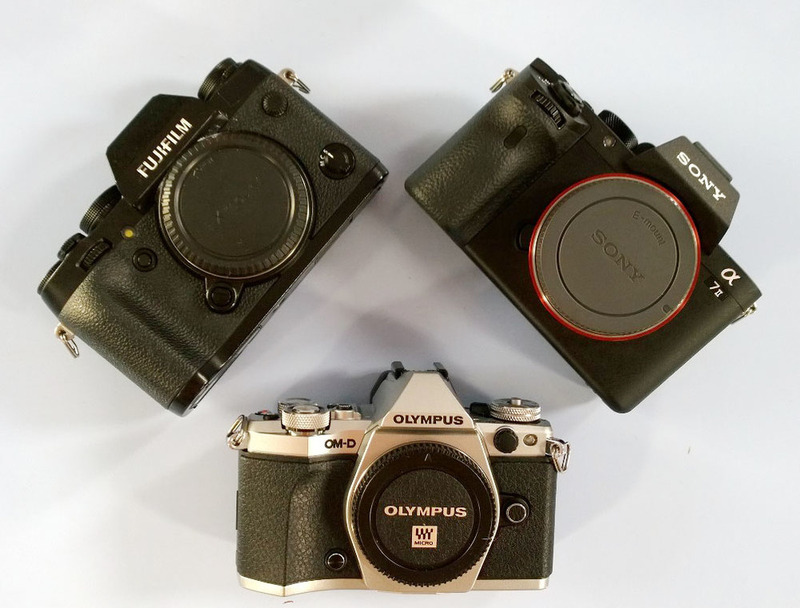 The Olympus and Fuji have silent shutters. The Sony, though quieter than the A7r, still has a fearsome 'clunk' when it goes off. Not sure why the excellent electronic shutter from the A7s didn't make it to the Sony. That Olympus retro chic wins out here. So there you go. My personal choice and of course just a bit of fun really. I'm sure others would have a different take on this. Just out of interest, adding up the 'scores' this is what order the cameras come in. Not sure how much this means, but maybe it explains why I'm so taken with the Olympus. 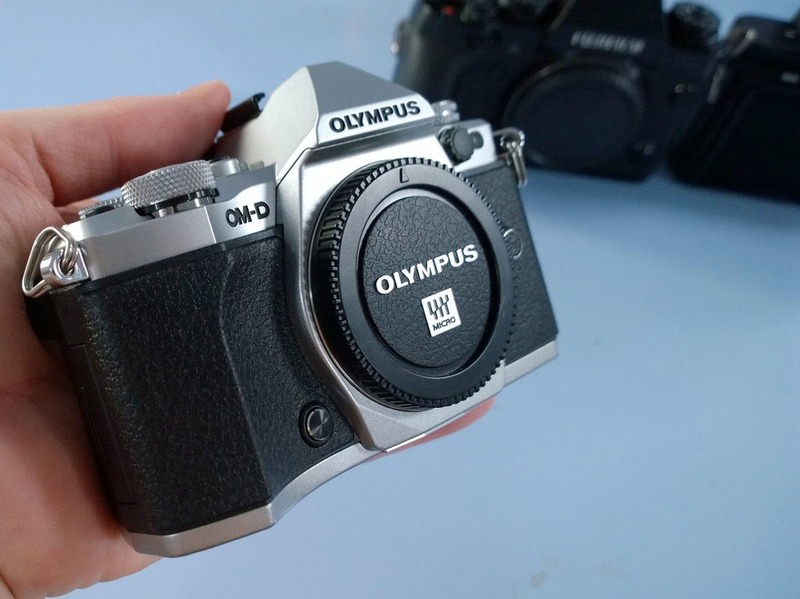 And I have to say that if you asked me which camera would I choose if I could have only one - it would be the Olympus OM-D E-M5 II. And yes it's the newest, but I haven't had the Sony very long either. No posting tomorrow, I'm (hopefully) off to The Photography Show at the Birmingham N.E.C. I'm planning to shoot a lot of pictures and video there, as this year almost everybody will be there, including Leica, which I think is a first for this show. Certainly I don't remember them having a stand at Focus on Imaging, the forerunner to this.